Why Write a New Speech When You Can Just Use the Old One? I wouldn't usually regurgitate a GOP talking point, or for that matter one of their videos, but in the spirit of taking my cues from our esteemed President, I'm posting a video that compares last night's State of the Union address (really just a campaign speech on the taxpayers' dime) with the one he gave last year. And actually the year before that as well. The wording is almost the same in most of the cases, and in a few, it's exact. I hope he got a discount from his speech writer. If it's good enough for the country to have regurgitated speeches, it's good enough for the readers of this blog to have regurgitated political gotchas. To tell the truth, I didn't watch the speech because I knew it would be like all the rest. And the thought of it just made me want to regurgitate puke. Shutdown Ends - WhatWeThinkAndWhy Reopens! As hard as it is to imagine, some of you didn't know that this site was closed yesterday, all day long. Maybe you missed the post from the previous day which announced the shutdown (it didn't make the email notification that some of you receive), or maybe you had some huge personal issue that prevented you from performing your daily ritual of checking here for new content first thing after you pour your morning coffee, but either way, you didn't miss much. Actually, the site could still be accessed and some content on the sidebar was edited, but it's the thought that counts when you're protesting. Like the OWS camp outs that protest "not getting enough of the loot", this site engaged in a protest without an expected result. It was a "Don Quixote" moment, but all it actually accomplished was giving me a day off from my unpaid gig as editor of this mostly quixotic blog. The truth is, other than just doing nothing, I wouldn't have a clue as to how to temporarily shut down the site. Having said that, and acknowledging that the whole thing was tongue in cheek, the issue of the SOPA/PIPA law was/is more important than many think. It was defeated yesterday (maybe because of the uproar caused by internet users who actually knew what it meant for the future), but like most bad legislation, it was more like a time out for naughty legislators than an actual long term "this is never going to happen" defeat. Many (maybe even most) people really don't understand what the hullabaloo was all about. Many even could be misled by the title of the legislation, which makes it seem like a reasonable idea. The Stop Online Piracy Act is (like a lot of purposely misnamed legislation) not really about that issue at all and wouldn't fix the problem if it was. And who actually has the time to dig in and learn about it in the midst of all the other things we are focusing on anyway? In order to fix the time and distraction problem, it's WWTAW to the rescue! The Khan Academy, which was highlighted here in a post a few days ago, has put out this short educational video which explains the situation in a way that anyone can understand. We pride ourselves in making the obvious more understandable. We are, after all, simple minded. Don't you feel so much better now that this blog has reopened? Hat tip to Leah for suggesting this video via Face-book, which could have been shut down by SOPA if it had passed. In a certainly meaningless gesture, this site will be closed tomorrow, 1/18/12, in protest of the proposed SOPA Law - the “Stop Online Piracy Act.” Many large sites are doing it, so by golly, we are too. As sad as I am to risk the great harm that will befall our republic because people will not be able to read any new and terribly important content here, we must send a message to law makers. So buck up and suffer with me. Good ideas don't come from bureaucrats. At least I can't think of one that ever has. The messy free market is the mother of innovation. As we learn more about how we learn, the science of education continues to evolve. These new approaches lead me to wonder whether I would have become better educated if these techniques were available when I was a student. Sal Khan is an amazing person. And his ideas have now attracted the support of Bill Gates and others with the means to aid in their advancement. I found these videos to be enlightening and exciting. I hope you will as well. Quite a number of teachers, active and retired, read this blog and I'll be interested on their take on this. The classroom could look much different with ideas like this. The first video is about the ideas and the second is about the person. Just a few minutes long, it actually lets you learn some things about the candidate and his positions. About a month ago I was fortunate enough to attend a book signing luncheon in downtown Chicago, sponsored by the Heartland Institute, where I had the opportunity to hear Tom Palmer make a presentation on the topic of a new book that he edited, titled The Morality of Capitalism. A small book full of big ideas, it's very readable and I recommend it highly. During that speech*, Palmer (who, because I was a few moments late, was lucky enough to be seated next to me for lunch) referred to a term that I immediately knew would, at some point, be used when I got around to writing about what I consider to be a huge, but often ignored, problem. Even though I'm a know-it-all, somehow I always learn something fun and useful at these luncheons. The term was "undertaker" and the etymology was explained as; "an old English phrase meaning; one who undertakes some activity or task", or as it might be expanded, a risk or a business. The more modern term is entrepreneur. A reflection on my personal experience as a successful "undertaker" has led me to conclude that in today's environment, the seed of that undertaking could never have been planted, much less come to fruition. The barriers to starting a business as a floor broker on the trading floor of the exchange were so small as to be almost non-existent. You simply qualified for exchange membership (a minimal and relatively inexpensive task) and hung up your shingle. Success or failure was in your hands, not the result of being able to comply with myriad regulations and large capital requirements. Government hacks were not allowed to divine how many brokers were "too many" or if a person was clever enough to get a good execution of the stock orders for their clients instead of just "filling and billing" them. The clients themselves, or lack thereof, would decide that. Today, sadly, it's a novel concept to many. It was 1981 when I hung up our shingle and it was a simpler time in a much freer America. I was from an extremely modest financial background, barely escaped high school and scholastically unprepared for a formal college education. In other words, I was unintentionally perfect to test the theory that hard work and the drive to succeed were all that was necessary to achieve the American dream. There was nothing particularly compelling about my story back then. I personally knew tons of people who did better than we did with even less going for them than I began with. If it wasn't the norm, it certainly wasn't unique. And back then, it never occurred to me that someday I would mourn the loss of such an expected environment. But this isn't a piece about the past, it's about turning things around for the future. And hoping it's not too late for others to reach for the dream themselves. It's about our kids and our neighbors. It's about poor people not being poor anymore. It's not about hitting the target, it's about having a shot at it. So let's not waste time talking about government job programs that never work. Instead, let's examine how we can get back to what does work and always has. Identifying the problem is always the first step in fixing it. "They believed in an America where hard work paid off, responsibility was rewarded and anyone could make it if they tried - no matter who you were, where you came from, or how you started out. These values gave rise to the largest middle class and the strongest economy the world has ever known." Unfortunately the writer then descended into a predictable diatribe about corporate greed and the mythical notion that the government doesn't have sufficient regulatory power to keep those values alive today. As usual, and probably on purpose, they missed the whole point. In fact, they got it precisely backwards. Luckily, there is a group of lawyers at a place called The Institute for Justice who not only understand the gravity of the situation, but have been suing various governments on behalf of ordinary citizens for decades in an effort to re-secure our rights. It's good to know that people with legal expertise are there to back us up in a world where we don't stand a chance on our own against a cabal of crony capitalists and power hungry politicians. You and I can rely on our common sense to inform us that when two parties agree to engage in a legal activity for mutual benefit, no one - least of all the very government who is supposed to be defending our rights - should be allowed to interfere. But common sense alone won't prevail against governments who spend our own money to beat us back in court. Governments exist to defend rights, not to usurp them. It's more than a legal question, it's a moral imperative. What are some of these cases, you ask? There are more than can be tallied that we will never know about, but the "merry band of litigators" (as George Will has dubbed them) are working on a few right now that I think will help highlight how deep the country has become mired in the muck of lost dreams and jobs that never got created. One such case will make your hair stand on edge, but only because a state government is preventing a citizen from braiding it for you. It's Clayton v. Steinagel, a case about a lady who wants to braid hair for people who want her to do it for them. The Institute describes the situation; "Jestina Clayton, a college graduate, wife, mother of two and refugee from Sierra Leone’s civil war has been braiding hair for most of her life. Now she wants to use her considerable skills to help provide for her family while her husband finishes his education. But the state of Utah says she may not be paid to braid unless she first spends thousands of dollars on 2,000 hours of government-mandated cosmetology training—not one hour of which actually teaches her how to braid hair. In the same number of class hours, a person also could qualify to be an armed security guard, mortgage loan originator, real estate sales agent, EMT and lawyer—combined. Such arbitrary and excessive government-imposed licensing on such an ordinary, safe and uncomplicated practice as hairbraiding is not only outrageous, it is unconstitutional." So ask yourself; why the hell do we need permission from anyone to engage in a business anyway? And why doesn't Barack Obama, the first black President, stand with black people who want to work instead of receive government assistance? Politically it's a no brainer. But then again, maybe he doesn't have a brain.....oh never mind. I digress and this isn't a bash fest. Plenty of time for that in the next eleven months. "Jim and Cliff Courtney have a plan to bring economic prosperity to their small community of Stehekin, located on the north shore of Lake Chelan in the center of the state. Because Stehekin is accessible only by boat or plane, the Courtney brothers want to provide convenient ferry service across Lake Chelan so more people can enjoy the natural beauty and outdoor activities in the community their family has called home for four generations." "Unfortunately, the state of Washington has sunk their plan. A nearly century-old state law requires Jim and Cliff to obtain a certificate of “public convenience and necessity” from the state in order to pick up and drop off passengers along Lake Chelan. This requirement, which was implemented to protect existing ferry providers from competition, has resulted in a government-imposed monopoly on Lake Chelan ferry service since the 1920s." Read more..
All of us have our rights trampled upon when these laws are allowed to stand. Not to mention the jobs that never got created. And then there are the cases of making people get a license to speak to others about sightseeing in Washington DC (and elsewhere) and the case of the dangerous Interior Designers. You might enjoy the videos concerning those cases I have added below. So the point is that in all times and places our economic rights are just as important as our other rights if we are to remain a free country. But it's especially disconcerting to see the President talking about how greed caused lost jobs and how taxing the rich during a class war or borrowing more money to finance failed solar companies and the like will create new ones when a large part of the problem is that government is the biggest impediment to fixing the problem. And despite all the attention presidential wannabes give to them, it's not just big companies that are over-regulated, it's everyday folks like you and I too. Mr. President, and all you other geniuses who are trying to get his job, try getting the hell out of the way. The country needs more undertakers, not fewer. 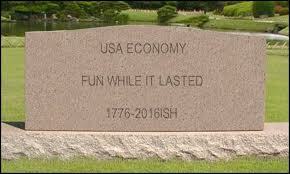 We have to get back to leaving them alone or the only thing we will need an undertaker for is to arrange a cremation for the economy. From the looks of it, it's halfway to cinders already. * A presentation almost exactly like the one I attended can be found here. It's an hour long, but if you watch it, it's quite likely to be the best hour you spend this month. I am a supporter and I have done all that I possibly can to promote your candidacy on my website and in personal discussions with friends. I've done that despite breaking my own goal of making the site about concepts and ideas rather than politics or people. I think it's that important because I think it may be too late if the country gets even one more term of Obama/Bush governance. And I want my freedom back. Having said that, what the heck are your advisers doing to earn their money? Last night, the incompetents at ABC news finally gave you an opening that you should have made for yourself long ago. They asked you the ONE question in last night's debate that, if answered correctly and passionately, could ignite your campaign like no other single thing. They asked you (I paraphrase) about how you could envision something different for the country if you were elected. About what might happen to us if we elect you to the White House. It was the equivalent of teeing up a political golf ball for you. AND YOU WHIFFED! The time for telling the country what is wrong and what caused the problems is over. Not everyone "gets" it, but most of them never will, no matter how many times you repeat it. So it's time to change lanes, hit the accelerator and work on the "vision thing." Not your vision, but theirs. Not the vision that your supporters have in their imagination. They "get" it. They have formulated it from what you say at the rallies and on the college campuses. You are preaching to the choir with them. It's the vision of the non-political types you need to inspire, those who don't have the time or the inclination to follow politics or economics because they are caught up in the struggle to live their everyday lives. They escape into sports or entertainment when they need a break from that. They need something to focus on in this election. I didn't major in business or marketing in college. In fact I didn't even go, but I know the difference between a feature and a benefit. You have been talking about features. It's time to close the deal by emphasizing benefits. People buy cars or houses because they can envision themselves in them and "feel" how their life will improve if they sign on the dotted line. People want to know how their lives will be better, or at least how they can expect them to be better after a few years of a Paul presidency. Will they be more free? How can you say it so they can see themselves "out from under?" Will they be more likely to get a job? They need to see themselves working again because of your policies. Will they have a more predictable life? Will they be able to plan again instead of merely survive the recession? Make them believe it because it's true, but not just because you say it. Will the value of their houses begin to slowly rise again? Why? Will they be safer from terrorists because you are president? Why? They think Obama is an appeaser, you need to tell them the difference between his approach and yours and allow them to envision why they will be safer with your approach. Will their crushing health-care expenses begin to get better? Tell them how and why. Convince them to envision why they will have better lives with your approach, not just why the current system or Obama-care is unacceptable. These things seem obvious to me, but if they are to your advisers, it's not apparent, and I've seen every debate. I'm not a political consultant and this advice is free. But unlike most free things, it's worth something. At least I think so. So get the people you pay to polish up the concept and prepare you for tonight's debate. Or kick them out and do it yourself. Your campaign needs to learn from two very different, but successful candidates. Barack Obama and Ronald Reagan. They both sold hope. And the people were buying. Now Obama sells resentment. And the "hope product" the people bought is being returned to the store. You need to sell them a product that actually delivers what his failed to. You have been scolding the people for a long time, and they deserved it. But the "Dutch Uncle" message is old now, they need an inspirational pep talk now. It's past time to give it. Tonight is the time to start. It may be too late already, but you'll never get too far past your current support level with the old game plan. If it's too late for your candidacy, it's probably too late for the country. That is why I'm risking being so presumptuous as to tell a future President what to do. Start now. There isn't a moment to waste. The ball is on the tee and it's begging to be hit right down the fairway. God bless you for your efforts no matter whether you take my advice or not. Republicans have been making a joke out of themselves recently so no sense in piling on right now. In which case, I thought it might be fun to poke a little light-hearted fun at my Democrat friends to start the new year. Which is not to say there isn't a heck of a lot of truth to the joke. Most good jokes have a lot of truth in them. You may have seen this going around in email, but it's worth a reprint as we move into an election year. When your family or friends cannot explain why they voted Democrat, give them this list. Then they can then pick a reason from this "TOP 12"..
1. I voted Democrat because I believe oil companies' profits of 4% on a gallon of gas are obscene, but the government taxing the same gallon of gas at 15% isn't. 3. I voted Democrat because Freedom of Speech is fine as long as nobody is offended by it. 6. I voted Democrat because I'm not concerned about millions of babies being aborted so long as we keep all death row inmates alive. 7. I voted Democrat because I think illegal aliens have a right to free health care, education, and Social Security benefits, and we should take away the social security from those who paid into it. 9. I voted Democrat because I believe liberal judges need to rewrite the Constitution every few days to suit some fringe kooks who would never get their agendas past the voters. 10.. I voted Democrat because I think that it's better to pay billions to people who hate us for their oil, but not drill our own because it might upset some endangered beetle, gopher or fish. 12. I voted Democrat because my head is so firmly planted up my a**, it's unlikely that I'll ever have another point of view.